The forms of the painted hills were like a faded photograph before me, their vibrant colors washing away with the receding light—the rusted reds, the full creamy yellows and the black lines and dots of concentrated manganese. Each color conveyed a story of the past, a geologic history of a changing land. I tried to imagine the rich forests of hardwoods and dawn redwoods that grew here during the wet times of the red soils, or the slow transition to the deciduous forests of the drier, more seasonal times that followed. A good hour I sat there and gazed at these rounded forms upon the back of the earth, lost in their patterns, lost contemplating time. Then I saw it, distinct yet ephemeral. A circular smudge in the sky, barely visible, muddled. It was the moon, already fully immersed in the umbra, rising as an orange globe above the hills into the darkening sky. Not the bitten orb I had pictured but a full sphere orange around the middle, red on the top with a yellow underbelly, a blood moon. As the light receded into night the globe became more pronounced, its supersized form hovering above the undulating black line of the horizon. With my camera I tried to capture what lay before me—an otherworldly scene: ancient ash stained by the legacy of their forests preserved as a storybook in the layers of colorful hills, and above them, the moon, as rich in color as the iron in their clay. The moon cast a faint and strange light upon the ground, blanketing everything in a dark silence so rich it seemed to speak. The night was still, the air not yet fully cold and the sky completely clear, free of the pollution of cities and their light, cloudless, just full and open. It felt immense, as if you could be swallowed up in it. 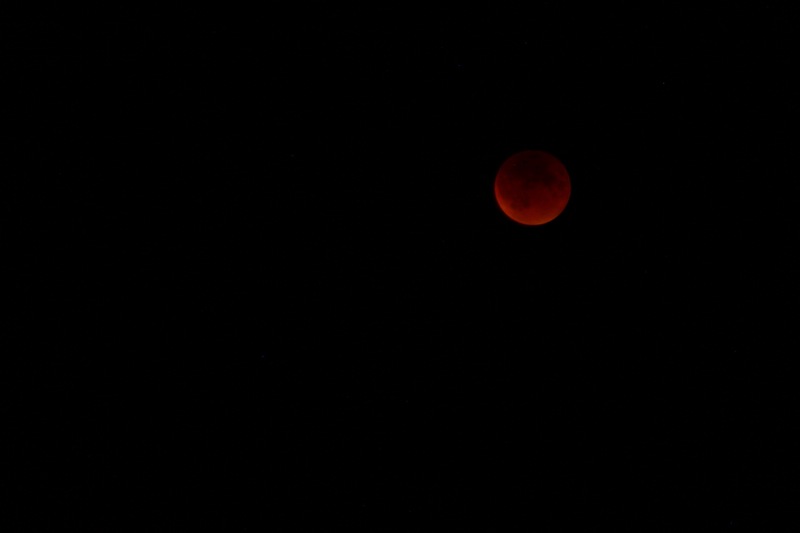 Night fell and the moon grew more orange, and then darkened until it was red brown and cast only a faint hue upon the world below. Above, the sky lit up. The power of the stars grew and the bright stripe of the Milky Way stretched overhead from the distant hills to the crags of the Carroll Rim. The moon, now fully eclipsed, lay in the shadow of the earth. And on the moon, it grew cold, void of atmosphere, now void of light, its temperatures plummeted. Around me the night grew colder, as if that cold were universal. I looked to the sky and marveled at its size, caught up in the immenseness of the galaxy, not able to truly comprehend its extent. To the hills I wasn’t even a blink, to the galaxy less than a speck. Before me lay the majesty of time and of space, and I was gratified to be a diminutive part of such vastness. As the moon begins to enter the shadow of the earth and again as it exits it, the shadow will appear as a semi circle across the white of the moon making it look like a piece is missing. The earth’s shadow has two parts: the lighter penumbra and the darker umbra. The penumbra is so faint it is difficult to see any changes during this time. When the moon enters the umbra you will see a dark part appear as mentioned above. As the moon moves more fully into the umbra it will begin to lighten, showing that this shadow is not completely dark. The color of lunar eclipses can vary from dark gray to brown to orange to red. The global weather conditions and amount of particulate matter in the air will affect the color. The reason we see the moon at all is because that sunlight is scattered and refracted around the edge of the earth by our atmosphere. To an astronaut standing on the moon during an eclipse the sun would be hidden and the earth would be ringed in a red light. Before the eclipse began the temperatures on the lit side of the moon hovered around 266 degrees Fahrenheit. With no atmosphere to retain the heat, its temperatures plummet as the sunlight dissipates. By the time the moon is fully eclipsed temperatures have dived to minus 146 degrees F—a swing of 412 degrees in less than 90 minutes. 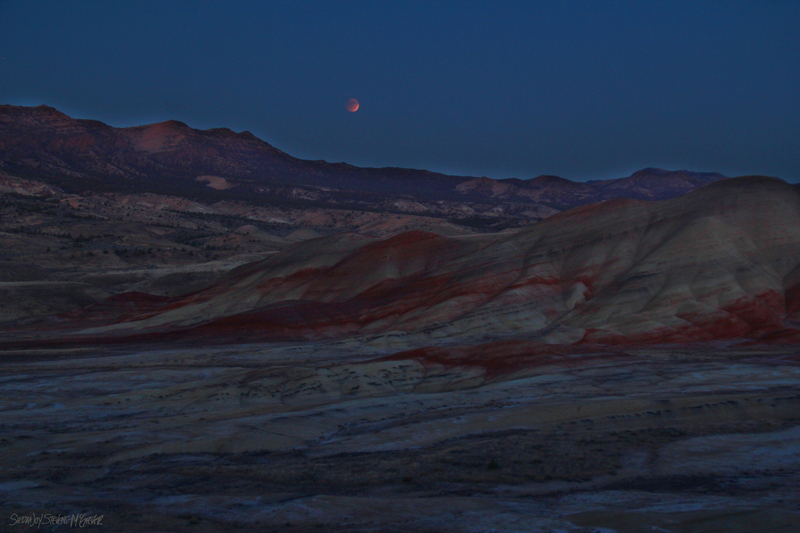 Love the majestic photo of the painted hills and the blood red moon. Quite memorable! I remember being there some time ago. It truly is an enchanted place. What luck to be there during an eclipse. Thanks for sharing the wonderful photo.